We now stock a range of 100% organic cotton clothing, nightwear, dungarees and trousers, made specifically to go over cloth nappies from Cut 4 Cloth, an ethically trading company, based in Cornwall. Cut4Cloth was started by one of our customers, Lucy Jewson, who found it difficult to find clothing cut wide enough to go over her son's cloth nappy and designed her own. The range is bespoke manufactured in India by an ethically and environemntally responsible company, and the quality of fabric used and maunfacturing detail is superb. From Australia we bring a summer selection of Bright Bots cotton clothing. Bright Bots are a range of baby and small childrens clothing cut on the wider side to fit over cloth nappies, in co-ordinating bright and pastel ranbow colours, in sizes to fit from 0-3 months up to 18-23 months. We currently have only a small selection of stock available, but new stock is due in soon. Exact colours may vary from screen picture. 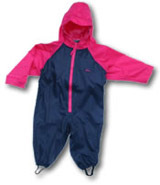 Keep dry in a roomy, breathable Togz waterproof suit.